Damn, she’s already got the facial expression pretty close. I’m on record not being a fan of the idea to reimagine the movie, which Fox says they’re doing, as opposed to simply filming the stage play, which the BBC recently did. 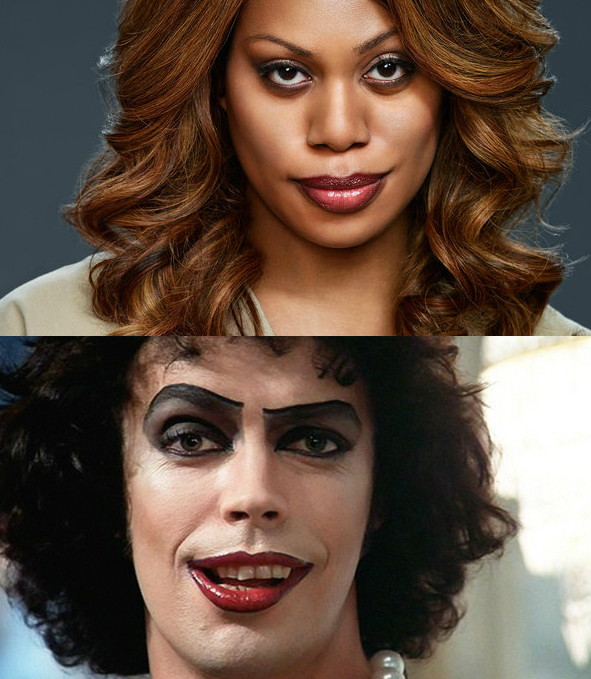 That said, Orange Is the New Black‘s Laverne Cox is probably the most interesting choice they could have gone with – Dr. Frank N’ Furter doesn’t exactly conform to binary gender standards, but the actor and the character usually lean male and self-describe as “transvestite,” while Cox identifies female. The Rocky Horror Picture Show, while groundbreaking in the ways it casually portrayed sexual orientation as fluid, is admittedly pretty white, so culturally retooling it a la The Wiz could be fascinating…or a flat-footed trainwreck. But kudos so far – by casting Cox, they’ve made me at least the tiniest bit interested in a way I never thought I’d be.